Sullivan, Brenton, Michael Muthukrishna, Frederick S. Tappenden, and Edward Slingerland. 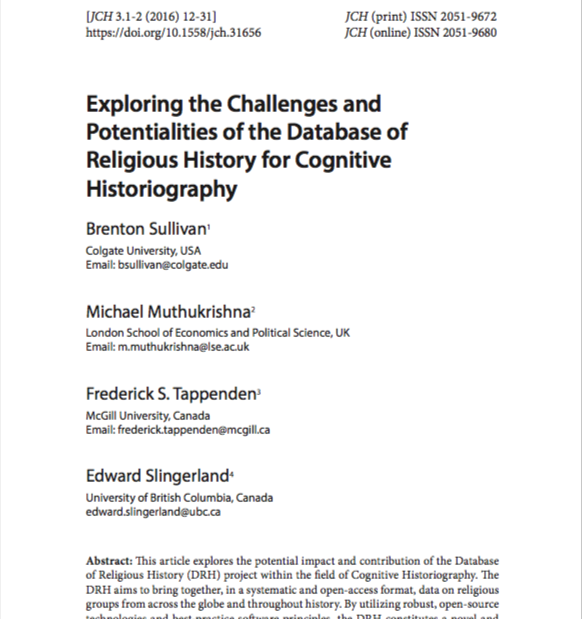 “Exploring the Challenges and Potentialities of the Database of Religious History for Cognitive Historiography.” Journal of Cognitive Historiography 3.1–2 (2016): 12–31. This article explores the potential impact and contribution of the Database of Religious History (DRH) project within the field of Cognitive Historiography. The DRH aims to bring together, in a systematic and open-access format, data on religious groups from across the globe and throughout history. By utilizing robust, open-source technologies and best-practice software principles, the DRH constitutes a novel and innovative approach to historical and cultural studies. As a contribution to the scientific study of both religion and history, the DRH offers data amenable to statistical analyses, thus providing tools for assessing diachronic cultural innovation and adaptation, the testing of grand narrative theories of religious change, and for enriching and revitalizing traditional fields such as comparative religions, history of religion(s), and anthropology of religion. In this article we explore the methods employed in collecting and digitizing historical data, identify our unit of analysis, outline the challenges of recruiting historians of various fields, and highlight the DRH’s methodological potential for both Religious Studies and Cognitive Historiography. Post-Print not available; see DOI: 10.1558/jch.31656 for published text.